Registrations are ongoing by default, but you can set date and time constraints to sell tickets to your event or accept registrations within your campaign. These settings are useful for timed early bird or day-of registrations. Note: you can also set an end date (deadline) for your entire campaign within Campaign Settings. Navigate to Campaigns > Edit this Campaign > Tool Settings > Manage to open your Registration Settings. Scroll down to the Registration Type. 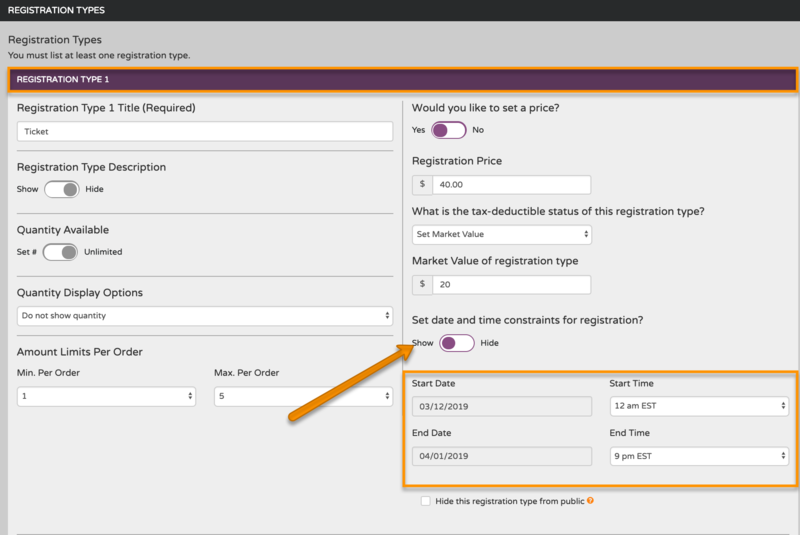 Toggle "Set date and time constraints for registration?" to Show. Select a Start Date and a Start Time. Scroll to the bottom and click Publish Registration Group to save your changes!